Charles Desilver (fl. c. 1850 - 1862) was a little known American map publisher active in the middle part of the 19th century. Desilver began is cartographic career as a partner in the firm Thomas, Cowperthwait and Company, the publisher of Samuel Augustus Mitchell's popular New Universal Atlas. In 1856, Desilver acquired Mitchell's copyrights and began publishing his own variant on the New Universal Atlas. Desilver revised Mitchell's maps with a new grillwork border, his own color scheme, new titles, and some updated political data. Despite a noble pedigree, Desilver's maps did not sell well - possibly because they followed the long and very popular run of Mitchell's own atlases. 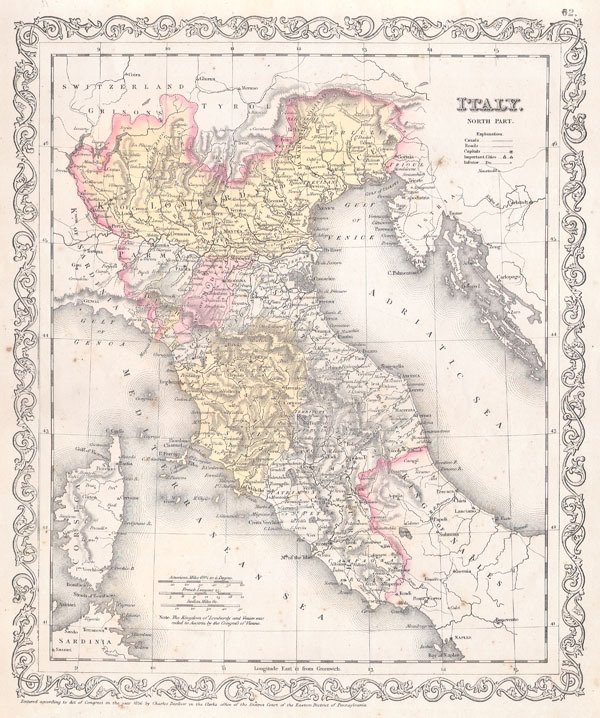 Desliver continued to publish his atlas until 1859 (though we have heard that he also published an 1862 edition). In 1859 he resold the Mitchell copyrights and printing plates to S. A. Mitchell's son S. A. Mitchell, Jr. The younger Mitchell again updated the plates with his own border and color scheme. He began publishing his own successful atlas in 1860. Fine or perfect condition. Wide clean margins. Blank on verso.